High-Efficiency Video Coding (HEVC), or H.265, has been the talk of the industry since gaining international standards approval earlier this year. HEVC is a new video compression standard and the successor to H.264/MPEG-4 AVC (Advanced Video Coding). 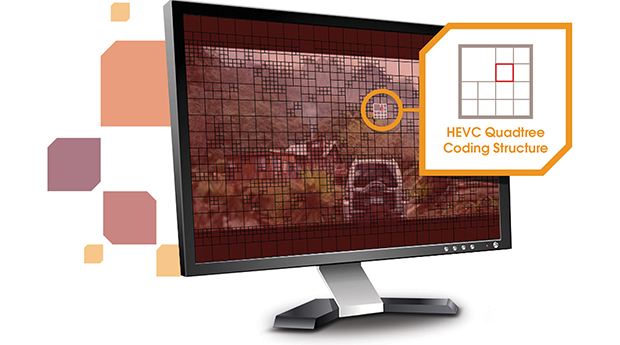 Developed by the ISO/IEC Moving Picture Experts Group and ITU-T Video Coding Experts Group, HEVC is designed for encoding (converting) and decoding (playing) video streams that can be stored and delivered more efficiently and economically. In January 2013, HEVC was cleared for commercialisation by the ITU and ISO/IEC MPEG. With major CE manufacturers such as LG and Samsung introducing ultra-HD and 4K support, the industry is rapidly moving towards this new compression technology that can maintain visual quality while shrinking video into nearly half the file size. With the potential of 40% better video compression than previous H.264 compression, plus resolutions as high as 8K this new standard is a game changer in the video space. With a range of video formats TV, video on demand (VOD), Internet and P2P- predicted to be approximately 86% of global consumer internet traffic by 2016, there is an increasing need to reduce the bandwidth requirement for delivering high-quality video. While HEVC will initially be a mobile and Over-The-Top (OTT) play, it will undoubtedly become the foundation for high-quality video and stands to fundamentally change the way consumers watch television. It will enable content owners to store more video for the same cost, broadcasters to stream video more efficiently across networks, and consumers to enjoy a much better entertainment experience as video is more easily streamed directly to their devices. But is the timeframe for mainstream adoption a long-term venture or a short-term market opportunity? Video delivery has already seen several significant jumps in compression technology. Firstly from MPEG-2 to MPEG-4 ASP, then MPEG-4 ASP to Advanced Video Coding (AVC), and most recently from AVC to HEVC. These advancements have historically taken the industry years to adopt. The broadcast industry for example is still largely reliant on MPEG-2 and is yet to make the switch to MPEG-4 AVC, despite the obvious compression gains. So what makes HEVC different? The reality is that video is more important than ever before. Digital video is driving the future of communications and the Internet. A recent study conducted by Rovi found that almost 60% of tablet users and 62% of mobile phone users across the U.K. view video on those devices at least 2 to 3 times per week. With many consumers experiencing slow load times and buffering issues, its easy to see why HEVC would be a welcomed solution. A huge momentum builder for HEVC adoption is 4K (3840x2160) video. 4K offers mind-blowing clarity and represents a major step up from 1080p (1920x1080 pixels) at four times the number of pixels. The problem, of course, is that 4K files are massive. But with a compression standard like HEVC, 4K suddenly becomes feasible. In fact, 4K could become the killer application for HEVC, like HD was for AVC. With more broadcasters and CE manufacturers experimenting with 4K transmissions Sony recently announced plans to trial 4K during Wimbledon demand for 4K screens is on the rise. Infrastructure players like broadcasters could use HEVC as the catalyst for development. Its conceivable that broadcasters currently working with MPEG-2, could see the leap in quality that HEVC can offer as the perfect reason to upgrade. Furthermore, with the likes of Netflix and Hulu applying pressure, large broadcasters need to start adopting new compression techniques to be able to offer more products and services and remain competitive. Unlike previous compression advances however, this time the entire ecosystem is firmly in place to drive the rapid adoption of HEVC. Today compression technology is tightly linked to digital rights management and adaptive streaming. Moreover, hardware and software vendors are solidly integrated into the ecosystem, enabling them to take advantage of new standards like HEVC faster than ever. With the explosion in online video and connected devices, consumers will be on the receiving end of a tidal wave of high-quality, low-bandwidth entertainment. And its going to happen a lot sooner than you think.